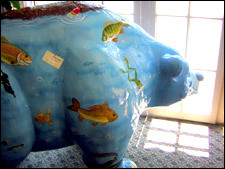 “Bubbles,” O’Brien and Gere’s bear decorated by Alan MacBain, reminds us of the importance of clean water, a mission for this environmental consultant company. 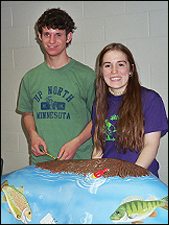 BASH students Jackson Williams and Jess Kemp stand over “Bubbles,” O’Brien and Gere’s bear decorated by Alan McBain. When I spoke with Bill on the phone about the project, he focused on the many ways O’Brien & Gere provide environmentally pure natural water systems. He suggested images from the website of filtration devices or dams and, as adults often do, scenes of natural bucolic settings suggesting a clean environment. But, as a children’s illustrator, I know that when little ones think of environment they think critters and lots of ‘em. 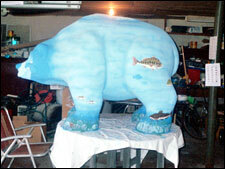 My task was to combine my own cartoon style with Bill’s information to make a bear that represents O’Brien & Gere to my regular group of the “too young to read” audience while satisfying the Bear Fever criteria of a unique artistic statement and doing so in a tight deadline to insure getting a clear protective topcoat application in time to be presented with the other bears in the Great Bear Fever Art Expo and to keep my promise to Bill to provide a piece of art he would never expect yet that would exceed his expectations........piece’o’cake! 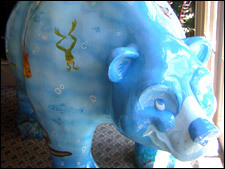 The Underwaterbubblebear is seen here as he roams the riverbed, holding his breath under the surface as he enjoys the environmentally pure waterway. As he wanders through he becomes one with the environment, appearing transparent and displaying the underwater wildlife that frolic along with him. 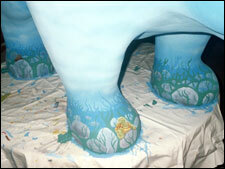 The face and fur above the water surface are made from Magic Sculp epoxy resin and the figure was painted with acrylic wall mural paint. What a privilege it was to was to work with Marine, a Rotary-sponsored exchange student from France, during her year-long stay at Boyertown High School. Marine joined BASH’s cable TV talk show “Insight” where she blossomed from a shy, quiet, occasional participant into one of our most talkative members. 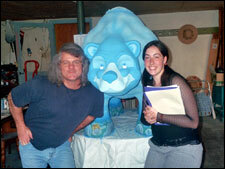 She became involved in Bear Fever accidentally: Paul and I needed help unpacking the first dozen bears. We arranged this effort during Insight meeting time so I could corral kids into helping! I’ll never forget Marine jumping up and down on the packing material which emitted loud pops in between her giggles! 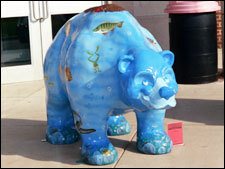 Linda Flederbach, one of her host mothers while in Boyertown, encouraged her to adopt the O’Brien and Gere bear because Linda’s husband Bill works for the company which was eager to support the project. Having access to “A Proud Employee/Associate of a Bear Fever Sponsor” made Marine’s involvement handy for everyone. Sadly, Marine left Boyertown before finishing her essay, but she left good interview notes which I will use to write in her stead. “Joyful” is how she wishes us to remember her, and we will. 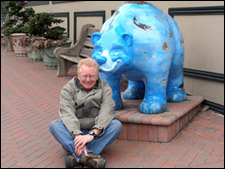 Her delight in interviewing artist Alan MacBain and his delight in her enthusiasm and energy capture the essence of the Bear Fever spirit. 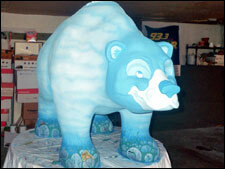 Bear Fever for Marine represents an experience for the community to be decorated, to show [off?] the different businesses and to inspire other communities in similar projects. Marine found Alan MacBain fun and funny, someone who sometimes enjoys bending the rules, someone who is always curious about what will happen next to challenge him. Alan was curious to see how other artists met the Bear Fever challenge through their diversity of styles and approaches. Provoking a smile is Alan’s goal, and he certainly achieved it with Bubbles. Smiling is all Marine, Paul, and I did in first meeting Bubbles. Alan “changed the face” by adding material to give it a Disney-esque quality. O’Brien and Gere’s mission is to improve the environment we live in by effecting and/or building total environmental solutions, total water solutions and capital and facility expansion services. In business for almost 60 years, O’Brien and Gere is a privately-held consulting firm with 25 offices across the United States, including a local office in Blue Bell, PA. 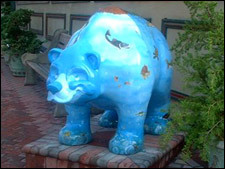 According to Bill, Bear Fever became an opportunity for O’Brien and Gere to join an “exciting, enjoyable community event for all ages” which would also familiarize the area with his firm’s work and commitment to an environmentally healthy community. Bill’s own staff include air quality experts in Blue Bell, PA; Syracuse, NY, Raleigh, NC; and Atlanta, GA, who pride themselves on providing ultimate client service and a total solution to a customer’s needs. O’Brien and Gere enjoys 85% customer satisfaction through repeat business, citing customer satisfaction as their key mission. Bill suggests that young people entering this field have a specific technical background including civil, chemical, mechanical and electrical engineering; meteorology; biology; business administration; and solid communications skills including technical writing. He includes dedication and a sincere willingness to learn, adapt, and be flexible as survival skills for life. Having a passion for people, a well-rounded personal life, and a desire to listen carefully along with an ability to deliver information clearly are necessary characteristics for consulting work such as he enjoys. In his free time Bill enjoys motorcycles, golf, community involvement, hiking, vacations, adventure, and running. He’s a “fun guy,” say his friends and Marine—a “big kid,” actually, and seeks to stay positive. House painting is included on his list of talents. Being financially set so he can travel the world with his wife and enjoy life is his personal goal. Professionally he seeks to become CEO/President of his company. “Aim high,” seems to be Bill’s signature mission because “while you may not reach the moon, you’ll land among the stars.” Inspiring stuff. Worth many smiles. Just why “Bubbles” was born.